Elizabeth Mullins will be entering the second year of her pastoral residency in April. She is excited to be serving her local church, Grace Communion Hickory, as the Community Developer, a pioneer position. 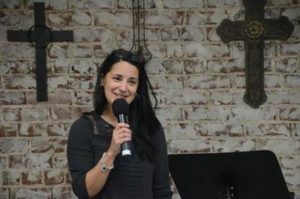 Elizabeth and her pastoral team are innovating this role as an integral part of the local church relaunch. Her role is dedicated to engaging the community residents, college students, business owners, city officials, law enforcement, and nonprofits in ways that enhance relationships, gather people together, and reveal opportunities for mutual support. It is truly a longing fulfilled to be in vocational ministry and a joy for her to work alongside her husband, Anthony. Elizabeth and Anthony are co-parenting two, grown daughters – which looks much more like friendship and mentoring at this stage – and enjoying their granddaughter. When I suggested the tagline “Church Community. Well Crafted.” for Grace Communion Hickory, I felt it showed our solidarity with our city, whose logo is “Life. Well Crafted.” It’s a reminder that we’ve linked arms with the people of our city with whom we share this place. Place matters. We don’t follow Jesus in the abstract but in an actual place. We want to be a church that is deeply rooted to a place and its people, for the long haul. Discipleship insists on enduring proximity. The tagline is also a reminder that crafting a community takes intentionality. To be sure, we’re not attempting to craft a utopia, focused on our individual prosperity and avoiding suffering. We’re intentional about cultivating discipleship that leads to a community who acts on their belief that God is Love and walks toward others’ pain and heartbreak until the circle of kinship leaves no one standing on the outside. As we set out to do the good and important work of crafting a community with intentionality, let us never forget that building the Church is Jesus’ work, work that is bigger than ourselves. We are participating in a beautiful mystery, His Bride. 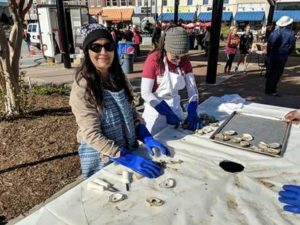 Volunteering at the annual Oyster Shuck and Peel fundraiser for the Hickory Downtown Development Association, of which Elizabeth is an elected board member. Church, and He finds Her stunning! This is Good News! And remembering this helps me see the Church through Jesus’ eyes and to fall in love with Her also. For me, Community Development can be summed up as, falling in love with my place and its people. And falling deeper and deeper in love with His Church… it’s contagious!